Huygens Probe Ready - Solar System Planets And Moons Section. Huygens probe to Go Solo. Cassini orbiter to enter a ballistic trajectory toward Titan. 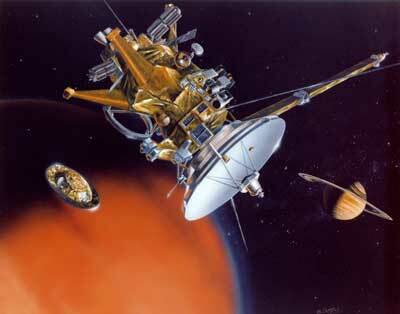 It's been a 7-year journey, but now it's almost over; Huygens will detach from Cassini on December 25th. On January 14th, it'll reach Titan and plunge into the moon's thick clouds and parachute down to its surface. It'll be transferring data back to Cassini for the whole journey, and if it survives the landing, it'll be able to send back data for an additional 2 hours until Cassini moves out of range. If everything goes well, scientists will get new insights into Titan's unique environment, which could be similar to the Earth's early history. At 1.25 billion km from Earth, after a 7-year journey through the Solar system, ESA’s Huygens probe is about to separate from the Cassini orbiter to enter a ballistic trajectory toward Titan, the largest and most mysterious Moon of Saturn, in order to dive into its atmosphere on 14 January. This will be the first man-made object to explore in-situ this unique environment, whose Chemistry is assumed to be very similar to that of the early Earth just before life began, 3.8 billion years ago. The first distant flyby of Titan took place on 2-3 July 2004. It provided data on Titan's atmosphere which were confirmed by the data obtained during the first close flyby on 26 October 2004 at an altitude of 1174 km. These data were used to validate the entry conditions of the Huygens probe. A second close flyby of Titan by Cassini-Huygens at an altitude of 1200 km is scheduled on 13 December and will provide additional data to further validate the entry conditions of the Huygens probe. After release, Huygens will move away from Cassini at a speed of about 35 cm per second and, to keep on track, will spin on its axis, making about 7 revolutions a minute. Huygens will not communicate with Cassini for the whole period until after deployment of the main parachute following entry into Titan’s atmosphere. On 28 December Cassini will then manoeuvre off collision course to resume its mission and prepare itself to receive Huygens data, which it will record for later playback to Earth. The European Space Agency owns and manages the Huygens probe and is in charge of operations of the probe from its control centre in Darmstadt, Germany. NASA's Jet Propulsion Laboratory in Pasadena, California, designed, developed and assembled the Cassini orbiter. NASA's Deep Space Network, also managed by JPL, will be providing communications support via the Cassini orbiter and relaying it to ESA’s control centre in Darmstadt for processing. The Italian Space Agency provided the high-gain antenna on the Cassini orbiter, much of the radio system and elements of several of Cassini's science instruments. The Huygens payload has been provided by teams including from CNES, DLR, ASI and PPARC, and outside Europe, from NASA.